Best Craft Book of 2009…The Beader’s Color Palette! 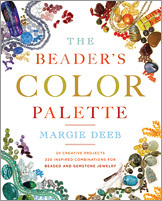 The Beader’s Color Palette has been voted by the prestigious Library Journal as the BEST HOW-TO CRAFT book of 2009. This is quite an honor and I am proud and thrilled! This means the best of all how-to books, including knitting, crochet, beading, wirework, scrapbooking and all the other hundreds of crafts books published in 2009. Yes, I am tooting my own horn because this book deserves it! 🙂 It is rich with ideas, creativity, culture, history, inspiration, and gorgeous art by over 40 of today’s finest artists. (Search my name or scroll way down to see the listing). I’ve created three FREE PDF previews of the book you can download here.